The Hawk WD-T313 is ideal for beginner trumpeters, it has a rich sound that sets it apart from other student trumpets. The WD-T313 not only sounds better than it’s competitors but it also has a sleeker design that gives the trumpet a much more professional look, it is certain to help you stand out in the band. The Hawk WD-T313 is in the key of Bb and has a beautiful silver body. It has a bell diameter of 123mm and a bore size of 11.66. 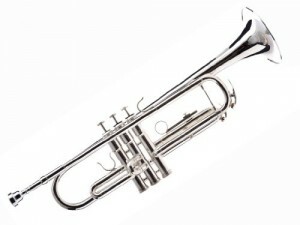 This high quality trumpet has everything you will need to get started with your new Trumpet. This beautiful silver plated B Flat Trumpet is ideal for the beginning student. The trumpet is used in many forms of music, including Classical, Jazz, Rock, Blues, Pop, Ska, Polka, and Funk, to name a few.